Thomas Meyer’s Beowulf, like the eponymous hero (and the monstrous villain too, I suppose), is an unrelenting force of nature. The deceptively casual choice of “HEY now hear” in place of the ever-puzzling Hwæt grabbed my attention and didn’t ease up until “song / sung / sing/er’s/ saga / ended” nearly eighty pages later. By then, Grendel’s arm had been hung from the rafters of heorot (a “visible token / inside gablehorn’s curve”), Beowulf had been rewarded for his bravery (“4 gold treasures”), Sigemund praised and Finn memorialized, and the warriors found sleep where they could. The poem and the plot take a brief rest before the horror of Grendel’s mother returns “along’s death’s road.” By then an already late night reading had become early morning and I had to give up my reading for the night. Still, like Grendel’s mother the next morning, I had to return to Heorot. It didn’t take me long to realize that there is something dangerously attractive about this Beowulf. Part Ezra Pound, part vorticist dream, part performance piece, and part bardic showcase, Meyer’s translation constantly pushes the boundaries of both verse and page and incessantly calls out to the reader for intense attention. Realizing that the oral arts of the scop and harp were the lifeblood of Beowulf’s original incarnation, Meyer takes the opposite approach, attempting to do for the reader with typesetting and mise-en-page what the sonorous bard could do for the listener. The moment of Grendel’s fateful encounter with Beowulf showcases Meyer’s approach. 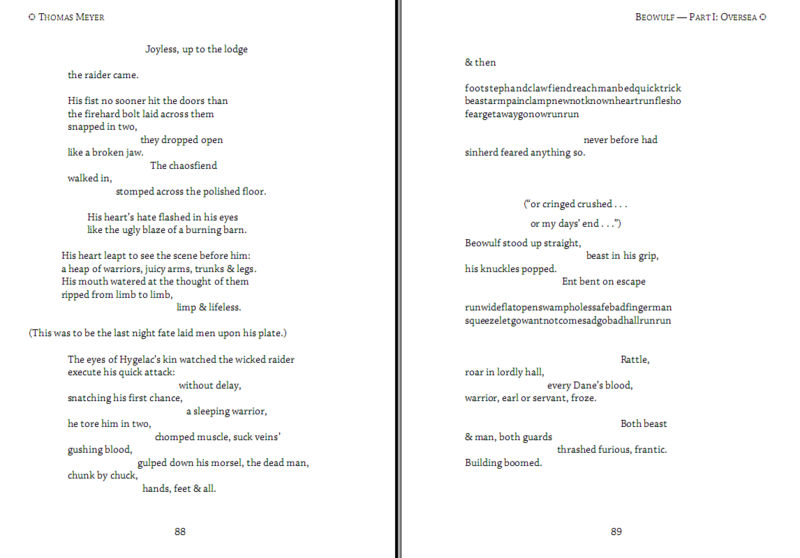 I include here the two-page spread from the ebook version of the poem. Meyer, through line breaks and justifications, enforces a kind of Wachowskian bullet-time effect on Grendel’s first attack. Each brutal step of Grendel’s assault is felt by the reader–”chunk by chuck,” bite by bite–until the pain hits and the pace becomes frenetic. A colleague of mine noticed an echo of John Gardner here and our disjointed glimpse into Grendel’s mind and his internal narration certainly recalls Gardner’s roughly contemporaneous exploration of the poem (Meyer first completed this translation in 1972, while Grendel was released in 1971). It’s the glimpse into the fractured mind of the monster that transforms an already unsettling battle-scene into something else: an actual nightmare come to life and violently overthrown. Yet Meyer’s translation is not entirely dependent on visceral impact, there is singular beauty here too. Hrothgar’s description of the fiery mere where Grendel’s mother makes her home is rightfully considered to be one of the more poetic moments within the entire epic. Meyer goes minimalist here, allowing each of these short descriptive phrases the space to create vivid word-pictures of the haunted mere. Despite Meyer’s claims in the backmatter interview that he is not a real translator, he offers an approach to the poem that successfully recreates the impact and overall experience of the poem. As Roy Liuzza argues in his back-cover review, “every line feels honestly rooted in the original text, the echo of a generous, open-hearted, and lovingly close reading of the poem.” Meyer’s transformation of Beowulf finds the soul of each caesura’d line in the original and distills it into an uncanny reading experience. There is a lot to like in both this poem and the impressive editorial work by David Hadbawnik, whose introduction preface to the poem and interview with the poet are both fantastic reads. (updated with thanks to Eileen: Daniel C. Remein wrote the marvelous introduction). I’ve been hooked on this book since it’s release near the end of August, and I can’t recommend it enough. Before I go, however, I have to say a few things about the amazing work by Eileen Joy (a UT PhD!) and punctum Books in publishing this edition. Punctum, an open-access publisher focused on bizzarro-awesome bits of scholarship like this, gives away a free ebook with each of their publications, allows for print-on-demand, and generally goes out of their way to make book-buying and reading a fantastic experience. Everything about this edition from the cover and internal artwork to the all-important type-setting is beautifully and professionally done, and they deserve some serious accolades for re-inventing the way scholarly presses should work. To buy the book direct from the publisher, or download the ebook first if you just can’t wait, follow this link. Dear Scott: what a lovely review of Meyer’s translation [which is, indeed, awesome], and of punctum books’s projects. I would also like to raise a shout-out to David Hadbawnik, PhD student in medieval studies at the University at Buffalo, SUNY, who “discovered” Meyer’s translation, which had remained somewhat hidden and unpublished for almost 40 years! Daniel Remein, a PhD student in medieval studies at NYU, also wrote the gorgeous introduction, and I highlight these things because punctum is dedicated to harnessing the powers + energies of grad. and post-grads [who don't necessarily have "real" jobs] to create a more democratic and vibrant cultural commons. Vive le Beowulf! One other quick comment just so everyone knows: David H. is the official editor of Meyer’s translation, and also conducted the interview included as an Appendix, Daniel C. Remein wrote the Introduction, and I did the graphic work/design of the interior, and Shasti O’Leary of SOS Creative did the cover art!